Some were dignified...and some came dressed for costume parties of varying themes. 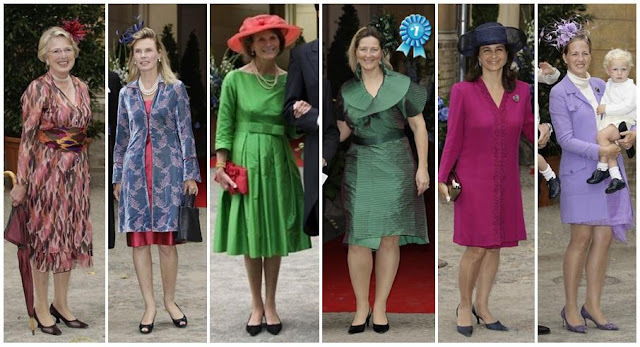 Duchess Elizabeth selected a Flintstones Safari theme, Countess Sandra went for a Minnie Mouse look (not helped by the fact that she looked so incredibly wee next to her husband! ), and Princess Susann opted for the Detract From Your Hair motif. 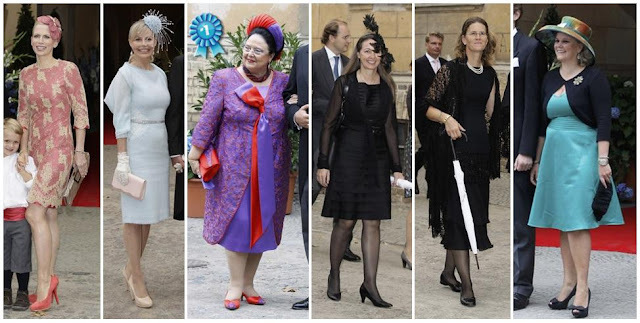 None of them hold a candle to our favorite perpetually themed Duchess, Camilla Castro, and her Pirates of the Caribbean 4 costume...but even she can't compete with sisters Louisa and Dorothea, and their courageous interpretation of the Mary-Kate and Ashley Olsen Go to a Royal Wedding theme. Thus, they shall share this "honor". Returning to the classy and elegant...you can never go wrong with Sarvath, Sibilla, and Ursula. Carolina and Margarita are injecting a welcome shot of color (plus, I just love that Margarita always turns up in her wedding best. She always seems so enthusiastic!). 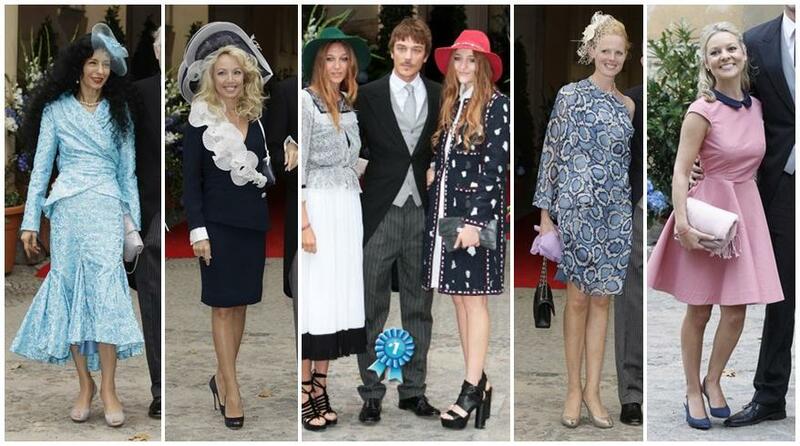 My favorites were Kelly and Nadja, the Princess of Schaumburg-Lippe, whose navy ensemble wins it by a hair. Who made your best- and worst-dressed lists? P.S. : Stay tuned for the outfits from the evening gala!